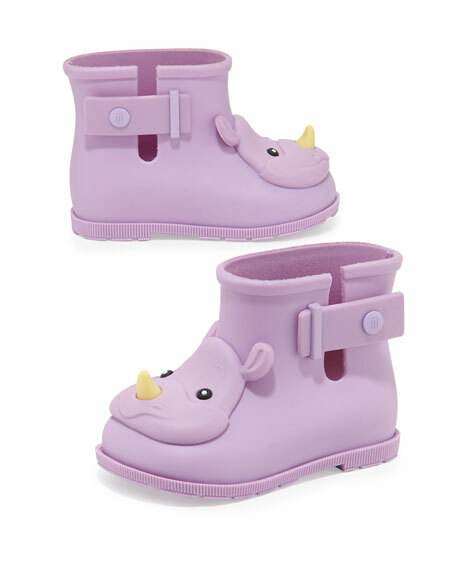 Mini Melissa Sugar rain boots with rhino motif. Snap-closure at sides aids in easy on and off. "Sugar" is made in Brazil. For over 30 years, Melissa Shoes has transformed vegan and eco-friendly plastic materials into fashion forward styles. Flexible jelly shoes are continually reinvented into modern wedges, ballerina flats, and sandals, all hallmarked by a signature tutti-frutti bubblegum scent. Collaborations with designers like Jean Paul Gaultier, Vivienne Westwood, and Jason Wu give the sustainable, globally recognized footwear line a high-fashion approach.